What a race it had been, its been so long since we had such an eventful race and drama. 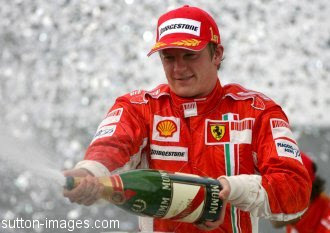 Finally Kimi Raikkonen crowned as the Formula1 World Champion 2007. Massa start - What a drive to the first corner. Forcing Lewis Hamilton to slow down and allowing kimi to over take him before the first corner. Alonso move - Alonso using this Ferrari move on Hamilton took the outside curve and over took him. This is what a team rivalry can do! Hamilton's mistake - What else can this rookie do, push hard and overtake Alonso. Risks are costly at those high speeds. He paid penalty on loosing track positions. WTF - I expected a problem on Lewis car later on the race. But this were worse earlier itself. But his never quit strategy was great and he did his best. Kimi first pit stop - This changed the game for both the Ferrari drivers. Kimi was given slighty more fuel than Massa so that he can have more time on track before the second pit stop. WTF again - Why was Lewis given such a small pit stop? Is it to give him a drive on traffic free track, different compound tyres or less load on the car to fly faster. I was not able to understand what went into Mclaren's team radio. Kubica's cocktail punch - Alonso was gaining track position, while out of the blues came Kubica making a drive of his lifetime to say Alonso, "Buddy you are not the champion this time, so move away, I will try a podium finish." It was the best overtaking maneuver of the entire race! Kimi's championship laps - As soon as Massa entered pits, kimi had a fire in his tail. He was breaking sector timings and had the fastest lap of the race to come out of the pits ahead of Massa who was struck by traffic. Times up for Hamilton - As soon as lewis took his 3rd pitstop it was evident that he will not be getting his championship, he was 20 sec behind the Williams driver in 6th place with just 9 laps remaining. Kimi did not even celebrate as soon as crossed the finish line, he started only after confirming Lewis was in 7th place. To roundup, it was an wonderful year for racing fans. The points tally says it all. Kimi - 110, Alonso - 109, Hamilton - 109. Kimi who deserved a win last year proved he was the best this year too. This rookie sensation Hamilton (My Hero) was impressive and sure will be a title contender for the coming season. Next season is all set for a bang with a three horse race with Alonso moving to Renault. More interesting is Dr. Vijay Mallya entry into F1. He's planning to rename this acquisition as team "Force India" which is subject to approval of FIA and other teams. This will push motor sport to next scale in India. Even more interesting was F1 image gallery showed picture of Vijay Mallya walking with Ralf Shumacher. Last but least, just before the clash between the Mclaren & Ferrari fans broke out in the place we watched. The commentators said, "Massa & Kimi are real team mates." Chalo, Got office tomorrow morning. Good night. Very nice explanation.. it went as if we saw with our eyes..
@Karthi - I though yu were at ur home for the race. I do agree with this statement related to sporting. win formula1 driving course. 1 race had all expectations, professionalism, retirements,and d of course tears. In my opinion in formula 1 sportsman should be their.